Cold Spring Harbor Beach Club in Cold Spring Harbor, NY hosted the 86th annual Atlantic Class National Championship on the weekend of September 18-20. The Atlantic is a 30-foot one-design keelboat designed by Starling Burgess that has been raced in Long Island Sound and Maine since 1929. The class made the transition to fiberglass hulls starting in 1957, but has maintained this lovely boat’s traditional design while adding updated rigging and sails. Since the first in 1929, the National Championships have always been a tightly contested series. Twenty-six boats from five fleets competed this year – from Kollegewidgwok Yacht Club (Blue Hill, ME), Niantic Bay Yacht Club (Niantic, CT), Madison Beach Club (Madison, CT,) Cedar Point Yacht Club (Westport, CT), the host club (Cold Spring Harbor), and one from the Columbia Sailing Club (Columbia, SC). This boat, A88 Solera, celebrated a homecoming, since for over 80 years she had belonged to one family that kept her in Cold Spring Harbor or Oyster Bay. The first day of racing saw a light air start followed by a 90-degree windshift as the southerly came in, catching out a lot of good crews on the wrong side. The second day brought a good southerly wind, but just one race. On the last day a typical northerly with big shifts in strength and direction made for demanding conditions but three good races. 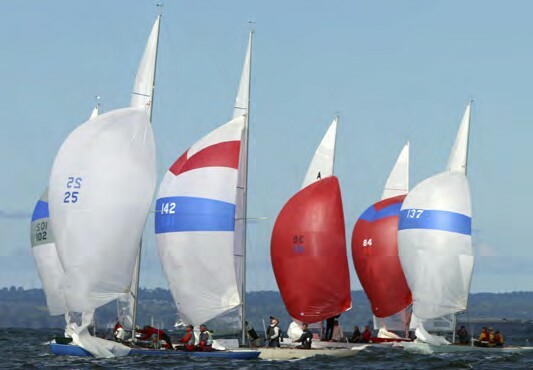 The series was won by David Peck sailing A130 Miss April, from NBYC – the 19th victory for a member of the Peck family, three of whom have won the Nationals. Close in second place was a very consistent Tim Britton from KYC with A49 Transit, and third Ian Evans (also from KYC, but a winter resident of Bridgehampton, NY) with A44 Try Again. Cold Spring Harbor’s Doug May in A56 Tara placed sixth. Cold Spring Harbor Beach Club provided moorings for the fleet, meals and box lunches for 120 sailors and race committee, and housing with club members for over 70 guests. The Principal Race Officer was Eric Johnson from Seawanhaka Yacht Club in Oyster Bay. For more information on the Atlantic Class, photos of the racing, and to order a copy of The Great Atlantic: The First 85 Years, a beautiful and lavishly illustrated history of the class by third generation Atlantic sailor John Rousmaniere, visit the class website at atlanticclass.org.